Gote no sente is a Japanese go term that refers to a play that appears to be gote, but is really sente. It is normally good play. This example comes from here. The solid connection at may appear to be gote, but it threatens to play at , capturing the stones and saving the stone. It is really sente. The term 后中先 (hòu zhōng xiān) is often translated as gote no sente, and the example above qualifies as a 后中先. 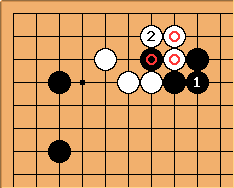 However, 后中先 actually describes a move that is temporarily gote, but leaves behind good followup moves, so 后中先 has a usage broader than gote no sente.